Al-Arafah Islami Bank Limited Recruitment Job Circular 2016. Al-Arafah Islami Bank Vacant Job Circular available now. Al-Arafah Islami Bank Job Circular 2016 has been found my website http://AllExamResultBD.com/. This job title is the various category such as “Management Trainee Officer (MTO), Executive Officer (On probation)“. Excellent Communication and interpersonal skill good command in English and Bengali (oral & written) Proficient in Computer skill in MS Office & Internet. Hard working and ability work under pressure. Al-Arafah Islami Bank Career to build a long-term sustainable financial institution through financial inclusion and deliver optimum value to all stakeholders with the highest level of compliance. Let’s Check the Career Opportunity at Al-Arafah Islami Bank Limited. 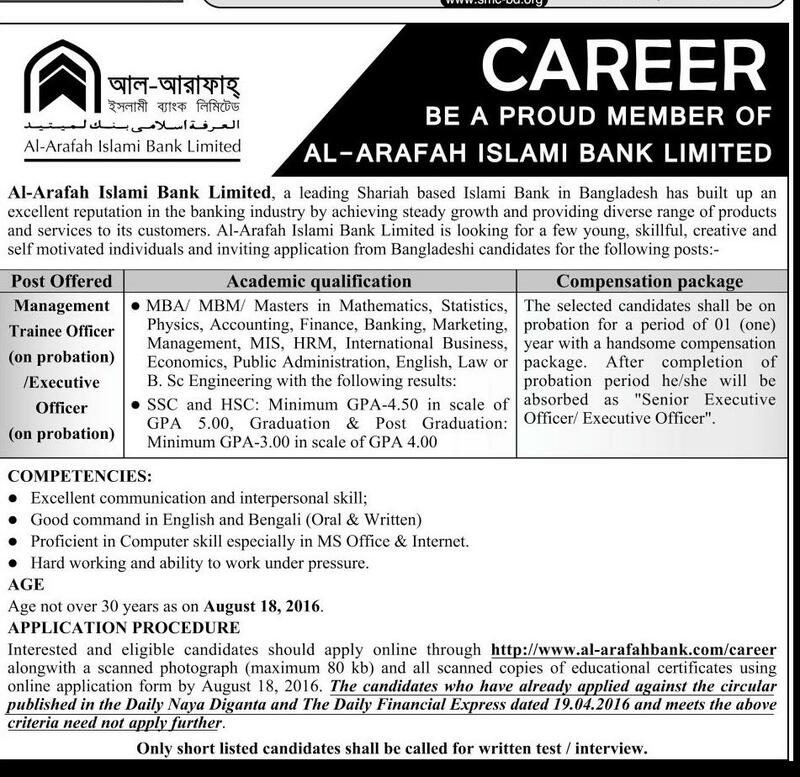 All Job Circular of Al-Arafah Islami Bank Ltd will available here. ■ Job Description: This job position is the good command in English and Bengali (Oral & written). Proficient in Computer skill especially in MS Office & Internet. Hard working and ability work under pressure. ■ How to Apply: Candidates have to send their to Head of Human Resource Division, Al Arafah Islami Bank Limited, Head Office, 7th Floor, 36 Dilkusha, C/A, Dhaka in a sealed envelope mentioning the post applied for on the top of the envelope alternatively candidates can also apply online through www.al-arafahbank.com on or before August 18, 2016. Al-Arafah Islami Bank Job Circular 2016 Publish Recently. All Interested Candidate apply for Al-Arafah Islami Bank Jobs 2016. Al-Arafah Islami Bank reserves the right to accept or reject any or all the applications without assigning any reason whatsoever. Al-Arafah Islami Bank Ltd carefully manages a learning environment career development strategy smooth progression of bank talents. Al-Arafah Islami Bank offers an excellent organizational culture and competitive compensation package in a way which always match our employees’ desires. Let’s Check Details Quickly. Filed in: Job Circular Tags: al arafah bank jobs circular, Al-Arafah Islami Bank Limited career opportunity, Al-Arafah Islami Bank Limited employment notice, Al-Arafah Islami Bank Limited recruitment circular, Al-Arafah Islami Bank Limited vacancy announcement, all bank jobs, all bd jobs circular, all jobs, all newspaper jobs circular, bank jobs, bank jobs bd, hot jobs, islami bank jobs circular, jobs today, www.al-arafahbank.com career.